1 pinch of safron diluted in warm water. Fry the onions till lightly brown in oil in a cooker. Add red chili powder, coriander powder and salt with some water and cook till oil separates. Add curd and cook till masala takes a deep red color and oil separates again. Add boneless chicken with some water. Cook on low flame for 30 min. Make a thin paste of cashew nuts and ginger in a mixer and add to the cooker. Cook for another 30 min. Add cardamom powder, kewra water,lemon juice and safron water to the cooker and cook for 10 min. and take off the gas. Serve with hot chapaties or boiled rice. * To make fresh tomato puree boil water in a pan and put 5 tomatoes in it after scooping their eyes out and making a plus sign with a knife on the bottom of the tomatoes. after 5 minutes throw out the hot water and rinse the tomatoes in cold water. Now peel off the skins and blend the tomatoes in a mixer. Heat some oil in a cooker and add the fresh tomato puree. Cook till oil separates. Add the onion paste cook till oil separates. Add all the dry masalas with some water and cook till oil separates. Add curd and mix it well in hi-flame till oil separates. Add the chicken pieces and cook on low flame for about 30 minutes. Add this paste to the masala in the cooker and fry well till oil separates and the white color of the cashew paste is gone. By now the chicken should be done. Serve hot with fresh chapaties. 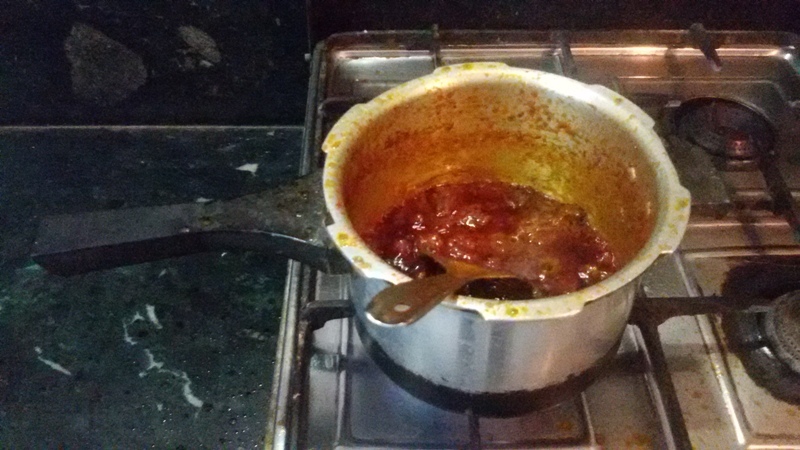 Heat the oil & Desi Ghee in a cooker. Add all the Saabut Gram Masala. Add the onions & fry the onions till they are brown. Add red chilies, dhania, turmeric & salt with some water & fry till oil septrates. Add curd.While adding the curd ensure to stir the mixture on high flame till the masala comes to a boil. Keep the flame on low heat and keep frying the curry till it takes the color of deep oily red chilies. Add the Garlic paste and the ginger paste & green chilies to the curry and cook some more. Add Chicken to the Masala and put in a baking tray and put in the oven to cook. Once the oil starts bubbling set the temperature to 150 degrees and cook till done. Most of us live in nuclear families in urban areas in this age of modernisation so what do you do with the Roties you and your family members fail to consume at meal times? Earlier we used to feed them to the stray cows roaming in the streets. Those stray cows have been rounded up and given accommodation in Goashalas on the outskirts of the Urban areas to chew their cud in peace. Milk giving cows are expensive animals and are not allowed on the streets and are housed outside the Urban areas in Dairies any way. Not everybody has a dog. And you can not just throw away food! So only thing you can do is consume them yourself. Here are five ways you can consume them depending on your taste. Tear the Roties in little pieces and put them in a bowl and soak them in enough buttermilk so that they will be able to become soft. Add salt and red chilli to taste. If you like onions mince some and put them in the bowl and mix properly. Refrigarate the preparation before serving. It is a popular cooling delicacy in the harsh heat of Rajasthani summers. It is also perfect for people with teeth issues. Here is a preparation for the egg lovers. Make preparations to cook omelettes in proportion to the leftover Roties. Put required amount of oil in a non- stick pan put a roti in the pan pour the egg mixture with salt, chilli and minced onions on the roti and cook them together in the pan so that the roti and the egg mixture meld together. A delicious preparation is prepared. Serve hot. This one, though a no, no for the calorie conscious is a very easy option to prepare. Just before sitting down for a meal fry the left over Roties in a non-stick pan like you would prepare a Paratha and they will be as good as new. If you like your Parathas crisp, fry them on a low flame for a little while longer. If you like your Parathas soft like a roti, fry them on high flame for just a little while only. Depending on your taste you can use ordinary refined oil or desi ghee as a frying medium. Finally an option for the people with a sweet tooth! Break the Roties in little pieces and grind them in a mixer. Add sugar powder and hot desi ghee to taste in the roti powder. Mix well. It can be served as a sweet dish or with fresh Dal. Last but not the least you can always heat up the leftover Roties on open gas flame before serving. If you like them soft heat them up for a little while only on high flame but if you like them crisp heat them on low flame for a little while longer. 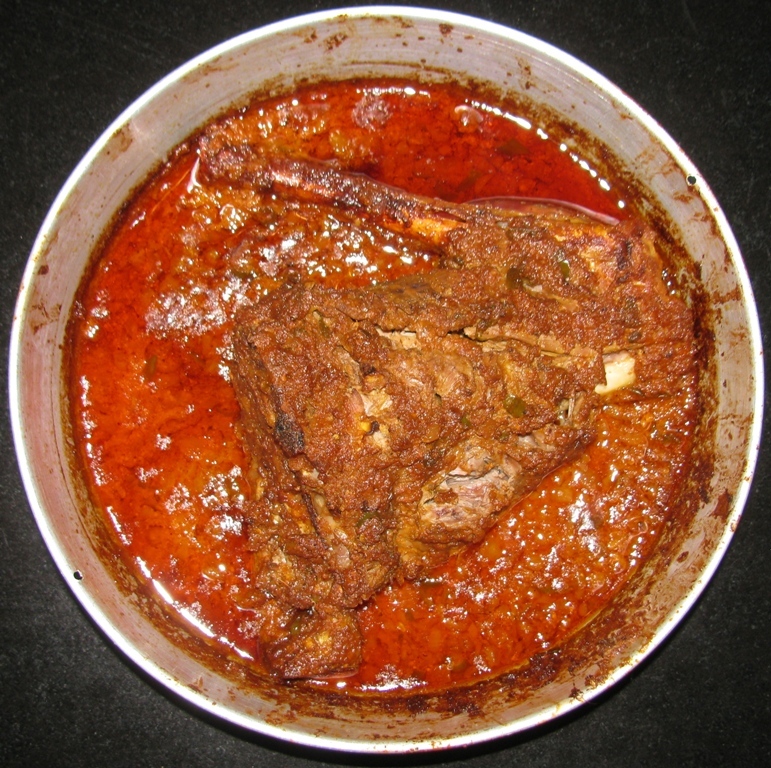 A simple Rajasthani recipe to cook spicy, red hot, Goat or Lamb Liver Curry. Heat the oil in a thick bottomed pan like a pressure cooker and add the minced onions once the oil is hot. Fry the onions on low flame till their colour turns light brown. Add the Ginger/Garlic paste with a little water so that the ingredients do not burn. Add red chili powder, coriander powder, turmeric powder and salt with some water. Fry the masala on low flame till it is cooked. Turn up the flame and add the curd while stirring the mixture till it comes to boil. Add the minced green chili. Cook the mixture on low flame till the masala takes on a deep red colour. 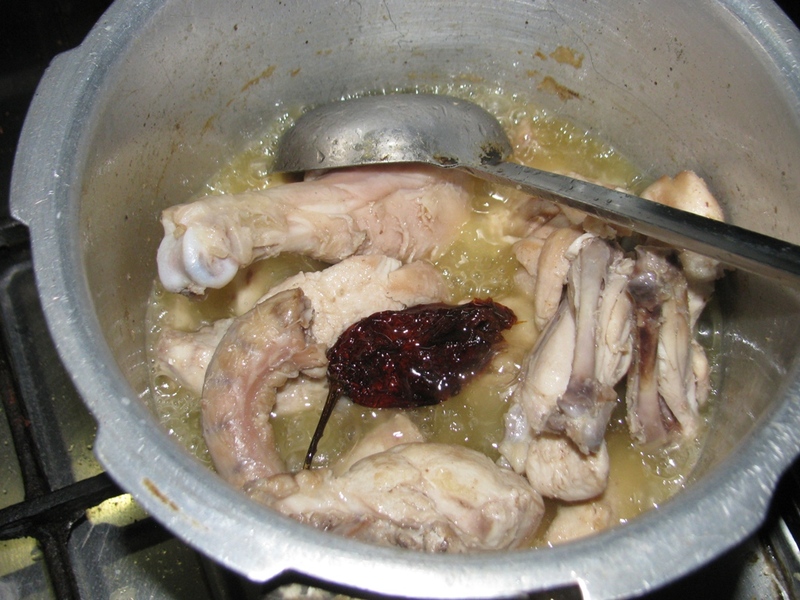 Wash the raw liver and add it to the masala with some more water and cook on low flame till the liver turns hard. Unlike other meats liver will turn hard when fully cooked. Just before taking the pan off the flame add the vinegar. Serve with hot chapaties as a full meal or it can also be served as a delicious snack with cocktails before the main meal. The idea for this post was triggered by the recent news report about thousands of chicken consumed everyday in Delhi. It got me thinking about the number of different ways we can prepare chicken for our daily consumption. We all have a pet recipe to prepare chicken or any other food for that matter. As you know chicken is white meat and good for health. Furthermore, what we eat everyday at home is way more tastier than any dish cooked in any restaurant. So, why not, let us share that recipe with everybody thru a post on your Blog or thru the comments section of this post. & Tag the Post #Chickenloversrecipe Exchange & post the link in the comments of this post. During my childhood I loved to read books & while I was so occupied I loved to eat countless Masala Papads. This is how we used to make it then. Roast the papad on a slow gas fire so that it takes on a uniform yellow color & does not burn. 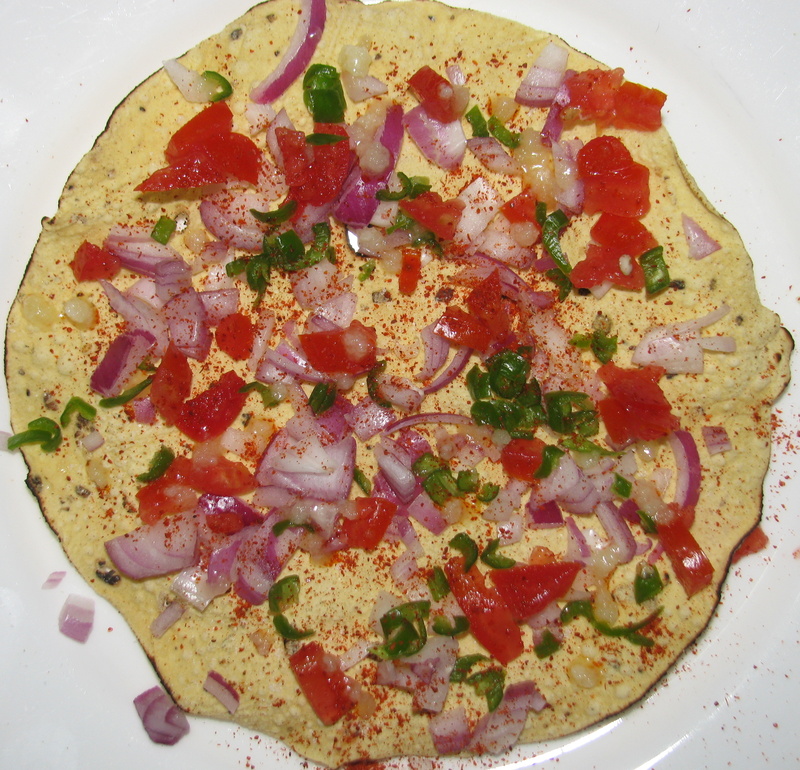 Sprinkle minced tomato, onion & green chilli evenly on the roast papad. Now heat a little desi ghee in a cooking spoon & add red chillies to the ghee, wait a bit & sprinkle on the roast papad sprinkled with the minced vegetables. The spicy snack is ready to eat! Some grated cheese, onions, tomatoes & green chillies. Apply some oil on a home sandwich griller & place 2 slices of bread side by side and put the grated cheese, onions,tomatoes & green chillies on both the bread slices, sprinkle some salt and pepper & cover them with the remaining 2 bread slices. 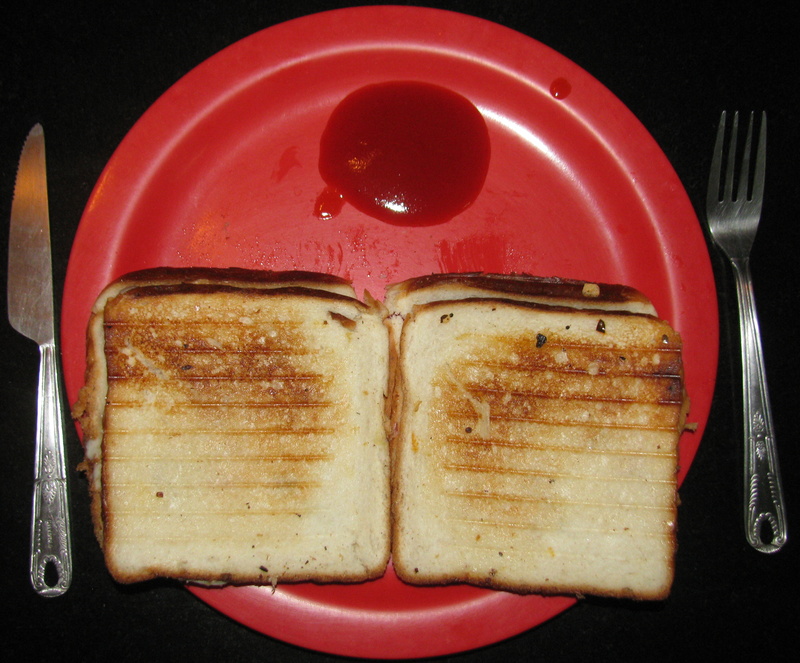 Put some oil on top of the bread slices on top & close the lid of the griller & wait till the green light goes on. Serve with Hot & Sweet tomatoe sauce.